Inspired by Arun Kundnani’s scare story about the toxicity of Jewish money (“Newt Gingrich’s agenda-setting big donor“, Jan. 27) were a few predictable reader comments. The text in quotes below are from another reader comment which “beachbear2012” was responding to. Please note the final passage of the comment by “beachbear2012”, which helpfully fleshes out the full scope of the conspiratorial plot. And, when reading, remember, it’s Zionists he/she hates not Jews. 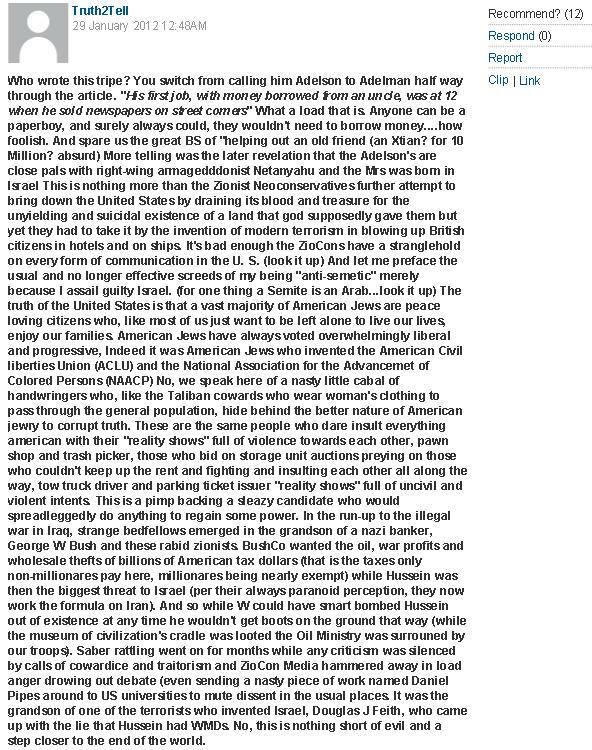 But, the following “truth-telling” comment about Jewish subterfuge (which received 12 “Recommends” before being deleted), posted under Paul Harris’s piece on Adelson, “Secrets of the billionaire backing Gingrich’s shot at the White House“, serves to make “beachbear2012” seem downright philosemitic. As you demonstarted, the anti-semitic commenters below the line are lapping these articles up most gratefully, as no doubt intended by the authors/editors. The Guardian – true to style! Regarding this – ‘(as if Adelson was different from other donors in this campaign;they didn’t single out anyone else)’ – I need to clarify: I meant to say, that all donors in the campaign give money to the politicians they like best; this in no way implies that they intend, or are capable of, manipulating the candidates’ policies according to their wishes. – This is be nonsense conspiratorial thinking, which the two writers have displayed in these articles, and which I strongly disagree with. Why was Truth2Tell’s comment deleted? Surely it reflected both Guardian’s and Arun Kundnani’s (not to mention those of other commentators) sentiments perfectly. If someone asked me what Guardian/BBC and their journalists thought of Israel and the Jews, I would show them Truth2Tell’s comment. Cif, please put it back on. 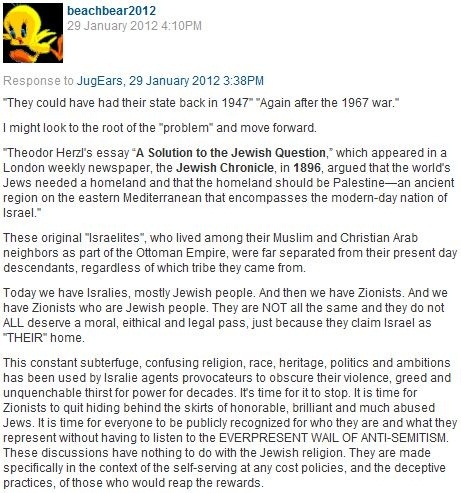 BTW there is an excellent article in JP….. “Paper slammed for Jewish security article”…….Some of the posts ATL and BTL are quite telling……. These two are the kind of mindless trash that the racist and trashy Guardian seems to attract.